before we’ll get drinkable rivers again. 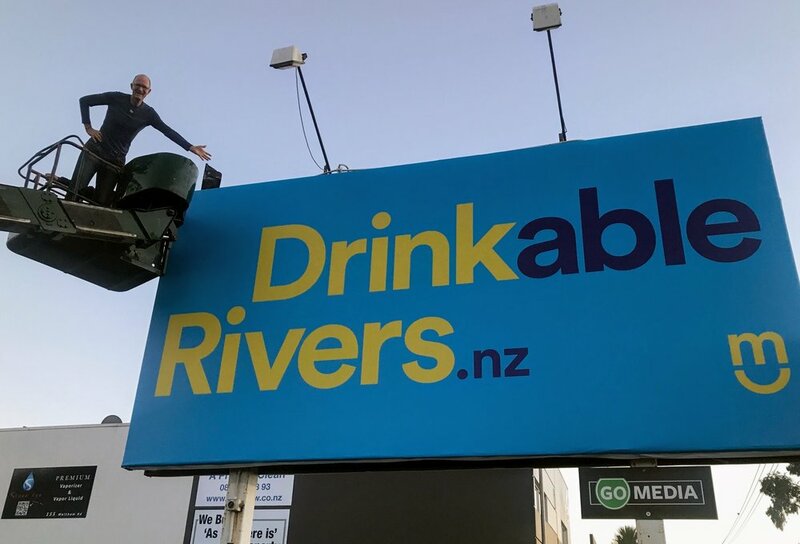 Four billboards go up across Christchurch, and two in Wellington. With this simple gesture, we asked why just swim when we want to be able to drink, as we used to? No, not all rivers all the time, we’re not so blind to the realities of ecology and biology to assume we can achieve that. But as an aspirational goal, and a way of raising the bar, let’s go for drinkable so we can at least swim safely. With generous support from Go Media, four billboards went up across Christchurch and another two went up in Wellingto. Here’s where they are, in case you wanted to take a photo and share it with your friends, and keep the conversation alive. The initial Facebook post went wild, touching 13 thousand people, thanks to your shares, and it sparked some important conversations. We connected with Marnie Prickett at Choose Clean Water, who connected us with many more people and organisations, both within private enterprise, local government, scientists and NGO’s, who have been leaning into this water quality issue, in some cases for a long time. Marnie was part of the fresh water rescue plan team, which did the work our government should have completed and implemented a long time ago. They created a 7-step plan for stopping the degradation and starting the restoration of freshwater quality in our streams, rivers and lakes. Marnie also pointed us to a meeting on Thursday at the Lincoln High School Hall, to address the sad state of Lake Ellesmere. A profound lack of vision was evident from Environment Canterbury’s suggestion we should turn our collective backs on any thoughts of restoring Lake Ellesmere and just exclude the lake from national standards, in order to maintain the status quo of dairy farming on the surrounding land. Haven’t we realised yet, that putting economics ahead of the environment can only take us so far. Try holding your breath while counting your money! Michael and Samantha Mayell attended the meeting where a great deal of data was exchanged as prominent speakers took to the stage. Did you know that we have surprisingly high rates of gastro caused by contaminated water in New Zealand, approximately 18,000 - 34,000 cases a year, the highest rate in the Western World. New Zealand's waterways are in a far worse state than most people realise, and Michael and Samantha left this event with even more fire in their bellies for Doing Something. Focus our attention on the problem. Greenpeace leader Russel Norman made contact this week, and the lunch conversation was heartening, as we looked at the many organisations and the various roles each is playing in the ecosystem of change. The role of Greenpeace is to shine a light on the problem, and they do this through actions that bring attention to the issues. Issues such as the absurd amount of public money being funnelled to subsidise further expansion and intensification of dairying. On August 2nd Greenpeace NZ took action at the Central Plains Water irrigation scheme in Canterbury. Several activists stopped work proceeding on the site for over 12 hours by locking themselves to machinery and inside giant irrigation pipes. There’s another and bigger action coming up on September 14th that you're invited to. Stepping back, it’s difficult to ignore the hard reality that the biggest polluter of many of NZ's rivers (and lakes) can be traced back to cows. Rather than helping farmers to end or reduce pollution, the government has been supporting existing practices and exacerbating the problem! A phone call and two emails with Peter Fraser, revealed some surprising economic realities in the dairy farming and land value arenas. Peter’s contributions and compelling logic, helped to stop the dam being proposed on the Waimakariri River in the Hawkes Bay - to enable more dairy farming. 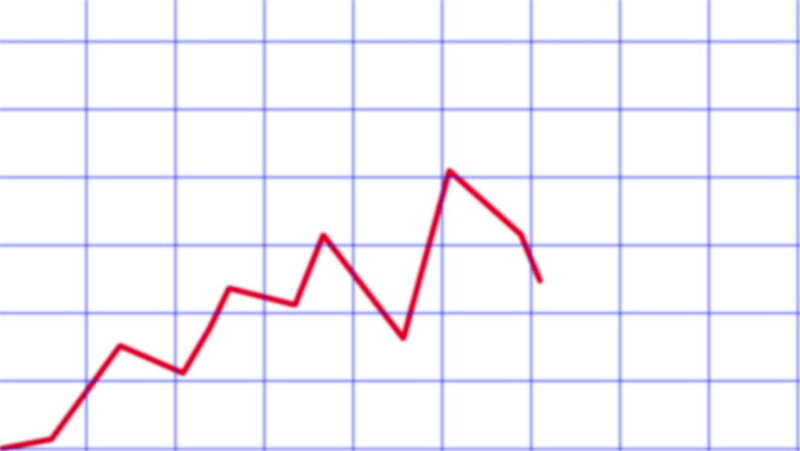 If I understood correctly, we are witnessing a money-go-round that is benefitting investors in dairy farming through increased, and inflated land values, that bear no relation to the productive capacity of the land itself. It’s not the earnings from milk production, that is justifying more dairying, instead the investments are a gamble based on witnessing past windfall, tax-free capital gains through inflated land values. Add the subsidies being granted for such things as irrigation projects, to the externalisation of costs to the environment, where the NZ public pays again to clean up the mess. This is part of the smoke and mirrors that allow marginal dairy farms to survive until the farm is sold, the massive debt paid off and the capital gains made. So much for cheap dairy products! Wherever there’s a problem, there has to be solution, and the solutions will be many and varied, so we’ll need to have many conversations. As a starting point it’s clear, there are just #toomanycows. So we’ll need to help farmers transition from intensive polluting animals to significantly reduced numbers of cows and sustainable regenerative plants. It’ll happen one farm at a time, as we open source the learnings, because every farm will need it’s own bespoke solution that matches its unique context. If you want to Do Something, start by sharing this article, and let’s keep the conversation alive. Start with 12,000 Dairy Farms totalling 5 million cows, providing $18 Billion in export revenues. Develop International Markets for plant-nutrient-products, such as those at nutrientrescue.nz, so we can shift away from our current ‘one product to one country’ / ‘milk powder to China’ paradigm. Grow Hemp Seeds (zero THC cannabis) and produce hemp milk and protein for local consumption and international export. Export the water that is no longer being used to produce cow milk (1,000 litres of water to make 1 litre of milk), charge a royalty and use the funds to help farmers transition from animal to plant farms. More ideas to come, send us yours ?? ?